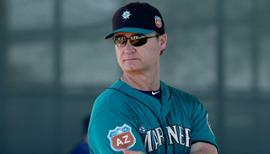 Draft: 2007, Philadelphia Phillies, 11th rd. April 10, 2019 RHP Justin De Fratus assigned to Tulsa Drillers from Oklahoma City Dodgers. April 8, 2019 RHP Justin De Fratus assigned to Oklahoma City Dodgers from Tulsa Drillers. April 2, 2019 RHP Justin De Fratus assigned to Tulsa Drillers. February 25, 2019 RHP Justin DeFratus assigned to Los Angeles Dodgers. November 2, 2018 RHP Justin DeFratus elected free agency. September 17, 2018 Oklahoma City Dodgers activated RHP Justin DeFratus from the 7-day disabled list. September 5, 2018 Oklahoma City Dodgers placed RHP Justin DeFratus on the 7-day disabled list retroactive to September 3, 2018. August 31, 2018 RHP Justin DeFratus assigned to Oklahoma City Dodgers from Tulsa Drillers. August 21, 2018 Tulsa Drillers placed RHP Justin DeFratus on the 7-day disabled list. August 20, 2018 RHP Justin DeFratus assigned to Tulsa Drillers from Oklahoma City Dodgers. August 19, 2018 RHP Justin DeFratus assigned to Oklahoma City Dodgers from Tulsa Drillers. July 28, 2018 RHP Justin DeFratus assigned to Tulsa Drillers from Oklahoma City Dodgers. July 19, 2018 Justin DeFratus roster status changed by Oklahoma City Dodgers. July 18, 2018 RHP Justin DeFratus assigned to Oklahoma City Dodgers from Tulsa Drillers. July 9, 2018 Tulsa Drillers placed RHP Justin DeFratus on the 7-day disabled list. July 8, 2018 RHP Justin DeFratus assigned to Tulsa Drillers from Oklahoma City Dodgers. July 2, 2018 Oklahoma City Dodgers placed RHP Justin DeFratus on the 7-day disabled list retroactive to July 1, 2018. June 29, 2018 RHP Justin DeFratus assigned to Oklahoma City Dodgers from Tulsa Drillers. June 22, 2018 RHP Justin DeFratus assigned to Tulsa Drillers from Oklahoma City Dodgers. June 18, 2018 RHP Justin DeFratus assigned to Oklahoma City Dodgers from Tulsa Drillers. May 25, 2018 RHP Justin DeFratus assigned to Tulsa Drillers from Oklahoma City Dodgers. April 26, 2018 Oklahoma City Dodgers activated RHP Justin DeFratus from the temporarily inactive list. April 20, 2018 Oklahoma City Dodgers placed RHP Justin DeFratus on the temporarily inactive list. April 19, 2018 RHP Justin DeFratus assigned to Oklahoma City Dodgers from Tulsa Drillers. April 2, 2018 RHP Justin DeFratus assigned to Tulsa Drillers. February 25, 2018 RHP Justin DeFratus assigned to Los Angeles Dodgers. November 25, 2017 RHP Justin DeFratus assigned to Aguilas de Mexicali. November 6, 2017 RHP Justin DeFratus elected free agency. September 28, 2017 Arkansas Travelers activated RHP Justin DeFratus from the 7-day disabled list. August 17, 2017 Arkansas Travelers placed RHP Justin DeFratus on the 7-day disabled list retroactive to August 15, 2017. 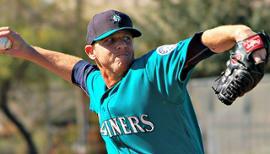 May 11, 2017 Seattle Mariners signed free agent RHP Justin DeFratus to a minor league contract. May 11, 2017 RHP Justin DeFratus assigned to Arkansas Travelers. February 28, 2017 San Diego Padres invited non-roster RHP Justin DeFratus to spring training. November 7, 2016 RHP Justin DeFratus elected free agency. August 17, 2016 RHP Justin DeFratus assigned to Syracuse Chiefs from Harrisburg Senators. July 22, 2016 Washington Nationals signed free agent RHP Justin DeFratus to a minor league contract. July 22, 2016 RHP Justin DeFratus assigned to Harrisburg Senators. July 14, 2016 Round Rock Express released RHP Justin DeFratus. June 12, 2016 RHP Justin DeFratus assigned to Round Rock Express. June 11, 2016 Seattle Mariners traded RHP Justin De Fratus to Texas Rangers. As the player to be named later to complete the Patrick Kivlehan trade from May 29,2016. March 18, 2016 Seattle Mariners signed free agent Justin De Fratus. March 18, 2016 RHP Justin De Fratus assigned to Tacoma Rainiers. March 16, 2016 Seattle Mariners released RHP Justin De Fratus. 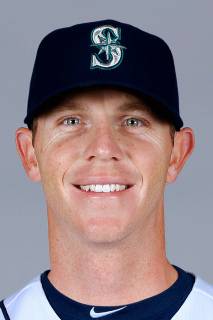 December 2, 2015 Seattle Mariners signed free agent RHP Justin De Fratus. 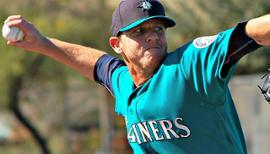 October 9, 2015 RHP Justin De Fratus elected free agency. October 7, 2015 Philadelphia Phillies sent Justin De Fratus outright to Lehigh Valley IronPigs. May 25, 2014 Philadelphia Phillies recalled Justin De Fratus from Lehigh Valley IronPigs. April 13, 2014 Philadelphia Phillies optioned RHP Justin De Fratus to Lehigh Valley IronPigs. May 11, 2013 Philadelphia Phillies recalled Justin De Fratus from Lehigh Valley IronPigs. March 17, 2013 Philadelphia Phillies optioned Justin De Fratus to Lehigh Valley IronPigs. September 2, 2012 Philadelphia Phillies recalled Justin De Fratus from Lehigh Valley IronPigs. July 18, 2012 Philadelphia Phillies optioned Justin De Fratus to Lehigh Valley IronPigs. July 16, 2012 GCL Phillies sent RHP Justin De Fratus on a rehab assignment to Clearwater Threshers. July 10, 2012 Justin De Fratus assigned to GCL Phillies. May 11, 2012 Philadelphia Phillies transferred RHP Justin De Fratus from the 15-day disabled list to the 60-day disabled list. April 22, 2012 sent RHP Justin De Fratus on a rehab assignment to Clearwater Threshers. April 3, 2012 Philadelphia Phillies placed RHP Justin De Fratus on the 15-day disabled list retroactive to March 26, 2012. Right elbow sprain. October 10, 2011 Philadelphia Phillies activated RHP Justin De Fratus. September 30, 2011 Philadelphia Phillies reassigned RHP Justin De Fratus to the minor leagues. September 17, 2011 Philadelphia Phillies recalled RHP Justin De Fratus from Lehigh Valley IronPigs. June 16, 2011 Justin De Fratus assigned to Lehigh Valley IronPigs from Reading Phillies. March 12, 2011 Philadelphia Phillies optioned Justin De Fratus to Reading Phillies. November 19, 2010 Philadelphia Phillies selected the contract of Justin De Fratus from Reading Phillies. August 31, 2010 Justin De Fratus assigned to Mesa Solar Sox. July 7, 2010 Justin De Fratus assigned to Reading Phillies from Clearwater Threshers. April 5, 2010 Justin De Fratus assigned to Clearwater Threshers from Lakewood BlueClaws. March 31, 2010 RHP Justin De Fratus assigned to Philadelphia Phillies. September 22, 2009 Lakewood BlueClaws activated RHP Justin De Fratus from the 7-day disabled list. September 3, 2009 Lakewood BlueClaws placed RHP Justin De Fratus on the 7-day disabled list. June 9, 2007 Philadelphia Phillies signed RHP Justin DeFratus.